That’s because we want to treat the cause of the problem, not just the symptoms. Many of our patients come from the communities of Cramlington, Blyth Valley and Morpeth – the majority having already tried different doctors and all kinds of medications before walking into our office. Our Cramlington Chiropractic philosophy is simple: a correctly aligned spine helps unwanted pressure off the joints, nerves, and muscles allowing you to stay healthy. Only one third of our nerves have pain sensation, which is why you can’t always base your health on how you feel. 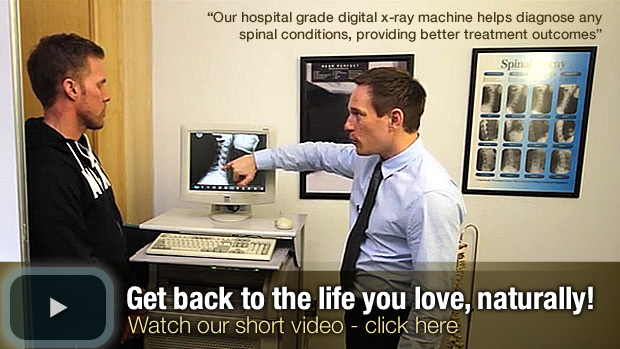 Dr James O’Malley (Chiropractor) has undergone over five years of training to become a skilled practitioner in spinal correction and maintenance. At Cramlington Chiropractic we are experienced in treating; neck, mid-back and lower back pain, sciatica, cervicogenic headaches, migraine prevention, numbness/pins and needles, joint conditions, complex postural problems, frozen shoulder and sports injuries. Regardless of lifestyle, from childhood to adulthood everyone needs regular spinal checks to stay active and healthy. Even your car gets checked each year! Once chiropractic is described to a patient “they understand it”. and nervous system must be maintained. spinal nerves are reaching every muscle, organ and gland in the body. in the normal nerve function that leads to pain and disease. determine the problem and tailor our approach. Health and wellness articles published by Cramlington Chiropractic: Chiropractor serving the communities of Cramlington, Blyth Valley and Morpeth.